News from Burundi (Info-Pac Nr. 76) | M.Afr. Dear confreres who have known, loved and served Burundi by bringing the Good News, Greetings. We must give thanks to God who made the seed of faith grow well. Our present attitude of gratitude could be defined in the words of Pope Francis: to the past of recognition, to the present of passion and to the future of trust. We have no doubt that you continue to pray for Burundi and you probably sometimes ask yourself this question: What else can I do for Burundi? We believe that you can continue living this happy, vocational and missionary “present time” of Burundi with passion. Please allow us to send you “our community dream” regarding the land in Makarakiza, a project prepared by the community of Gitega and which has received the support of all the confreres of Bujumbura. 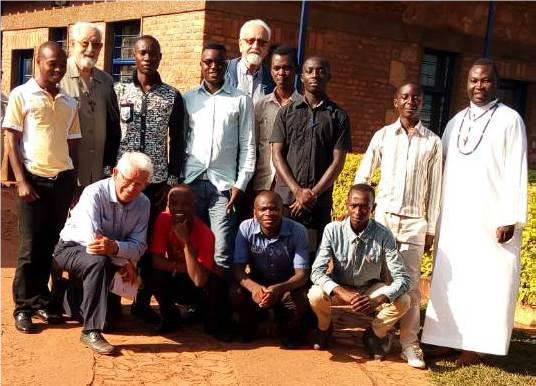 We are asking for help so that the “Burundi Sector” may be more and more present in Burundi, that the Church in Burundi may not close itself off, but may welcome more joyfully the missionary vocation. In this photo: M.Afr. candidates for Goma, 2018-2019 edition, with the PP: Bernard Lesay, German Arconada, Benno Baumeister and Jean-Bosco Ntihebuwayo during the preparatory session for Goma, June 2018. Of course, Cardinal Lavigerie had foreseen that Africans themselves would be the main evangelizers of Africa. But he never said that they would be the only evangelizers of Africa. The Cardinal has always been an apostle of the Catholicity of the Church, and of universal brotherhood. I do not think that his wish was for an autonomous African church apart from the universal Church. In thanking you for the welcome you will give our “Makarakiza Land Dream”, we entrust you with this African saying: “Where the foot cannot go, the heart goes”. If you are interested by the project, please read more about it in the Info-Pac 76.